Duplicati - Free backup software to store encrypted backups online. and more Duplicati is licensed under LGPL and available for Windows, OSX and Linux (.NET 4.5+ or Mono required). ###Features * Duplicati uses AES-256 encryption (or GNU Privacy Guard) to secure all data before it is uploaded. Filters, deletion rules, transfer and bandwidth options, etc ###Many Backends Duplicati works with standard protocols like FTP, SSH, WebDAV as well as popular services like Microsoft OneDrive, Amazon Cloud Drive " S3, Google Drive, box.com, Mega, hubiC and many others. ###Features Backup files and folders with strong AES-256 encryption. Save space with incremental backups and data deduplication. 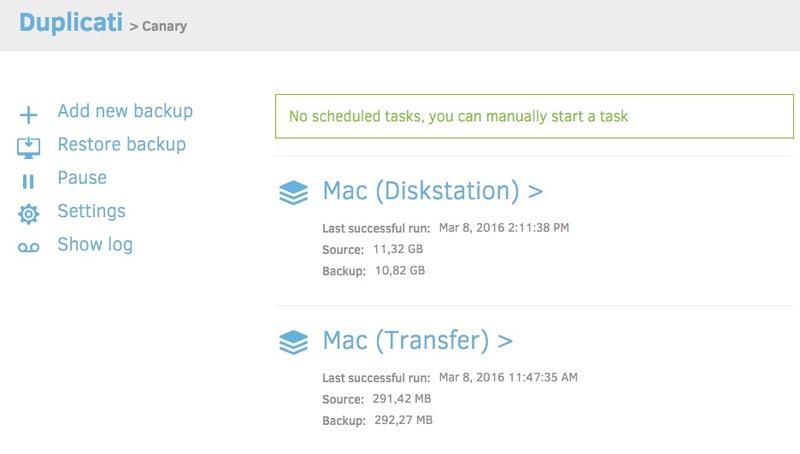 Run backups on any machine through the web-based interface or via command line interface. Duplicati has a built-in scheduler and auto-updater. ###Free software Duplicati is free software and open source. You can use Duplicati for free even for commercial purposes. Source code is licensed under LGPL. Duplicati runs under Windows, Linux, MacOS. It requires .NET 4.5 or Mono. ###Strong encryption Duplicati uses strong AES-256 encryption to protect your privacy. You can also use GPG to encrypt your backup. ###Built for online Duplicati was designed for online backups from scratch. It is not only data efficient but also handles network issues nicely. E.g. interrupted backups can be resumed and Duplicati tests the content of backups regularly. That way broken backups on corrupt storage systems can be detected before it’s too late. ###Web-based user interface Duplicati is configured by a web interface that runs in any browser (even mobile) and can be accessed - if you like - from anywhere. This also allows to run Duplicati on headless machines like a NAS (network attached storage). PACKAGE NOTES *** Click here to Patreon-ize the package maintainer.